Prominent & Leading Manufacturer from Pune, we offer automatic passenger escalator, passenger escalator, automatic escalator, heavy duty public traffic escalator and public traffic escalator. 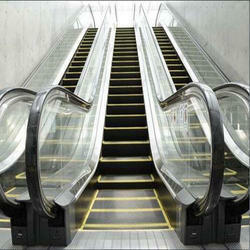 We are offering Automatic Passenger Escalator. With people-oriented philosophy in design and manufacturing, customer's needs such as safety, aesthetics and performance are taken into account, thereby bringing users an extraordinarily cosy, steady and safety riding experience. Adopt Φ70 contact roller to realize the high-precision horizontal step positioning to ensure a proper gap and prevent foreign matters between steps and skirting panel. The new design of the frontier board is free of the moderato’s overlap joint interference. 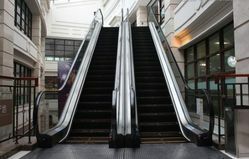 When a foreign matter is brought between the comb teeth and the step, this design will make it easier to move backward, touch the safety switch and stop the escalator. The innovative floating armrest handrail entrance is more flexible and smooth, thus reducing accidents to the utmost extent. In case of emergency malfunction of the escalator, pressing the emergency stop button and immediately stopping the elevator to avoid more accidents. PLC-controlled automatic oiling and lubrication system is able to give ideal automatic oiling to the transmission chain, thus extending the life of the transmission mechanism. We are offering Passenger Escalator. It is a high-quality, stylish, extraordinary and leading-edge product. It uses highly durable materials and adds more flexibility to the escalator in product design and environmental treatment, thus offering more flexible space for architectural design. The truss adopts the robotic welding technology, which greatly enhance the manufacturing process. It has lean quality and it is sturdy and durable, beautiful and elegant. The integral aluminium frontier plate is tough and rugged, stylish and light weighted, and easy for maintenance. The diameter of the contact roller is ф75. This can effectively reduce the roller pressure, and improve the step chain breaking force dramatically, increase the safety factor by 5-8 times. 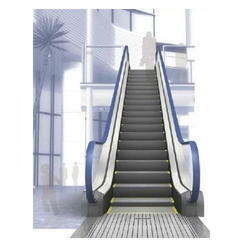 Jinshow B-type escalator adopts the stylish and beautiful stainless handrail bracket suitable for large lifting height. Outside of skirting panel, there is a transparent friction-reducing coating, effectively reducing the friction loss between the steps and skirting panel. The wedge has a spring structure and glass bracket. By tightening the spring, users can ensure that the wedge and glass is closely laminated, which is sturdy and steady and easy to be installed. Advanced control systems apply micro computer technology board technology. The fault detection function is further refined, thus greatly improve the safety performance. High-precision ladder way guide rail system can ensure the minimum gap and prevent foreign matters between steps and skirting panel. Patterned standard design of high skirting panel effectively improves its protective height and increase the safety of the operation. In case of emergency malfunction of the escalator, press the emergency stop button and immediately stop the escalator to avoid more accidents. 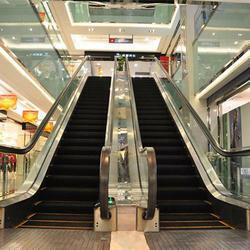 We are offering Automatic Escalator. It integrates the cutting-edge technology and diversified functions of modern escalator and leads the new trend of escalator manufacturing. On a consistent basis of superb technology, we pay more attention to adding the noble human-oriented concept, observing customer’s needs carefully, and highlighting the technological wisdom. Handrail inlet protection device: If a foreign matter is stuck between the rubber head and handrail, the safety switch behind the rubber entrance will work to stop the escalator. Emergency stop button: In case of emergency malfunction of the escalator, press the emergency stop button and immediately stop the escalator to avoid more accidents. The diameter of the contact roller is ф75. This can effectively reduce the wheel pressure, and improve the step chain breaking force dramatically. The safety factor will be higher. Large-height and high-intensity armrest guardrail is adopted. The protection height of the guardrail can amount to 1000 mm, which has improved safety performance. Meanwhile, new reinforced safety glass fixtures enable the fence to have strong stability. All lighting equipment uses LED lighting technology. Compared with traditional bulbs, it can save up to 80 % of the energy. 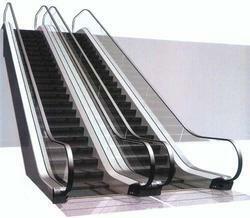 We are offering Heavy Duty Public Traffic Escalator. It is kind of heavy-duty escalator specially tailored for public traffic. With excellent product quality, superior operating performance and leading security guarantee, it can fully meet the stringent load requirements for high lifting height, great visitors flow rate and long transport time. Have no fear for the challenge from spatial height or the impact of the harsh environment or the long-time transport with large passenger flow. The escalator overcomes numerous difficulties in space transportation and makes every effort to provide you with the best solution. The microcomputer board master control system developed independently has a faster response and a more stable performance. Inverter control and star-delta conversion dual modes can ensure the consistent steady running of the heavy-duty public traffic type escalator. V-type handrail increases the contact area of the rotary end and the friction of the armrest, thus providing greater driving force for the running of the escalator. Handrail end drive mode is realized with the close connection of the secondary transmission, V-type handrail and the rotating wheel, which can decrease the friction coefficient of the handrail, thereby reducing energy consumption. Adhering to the concept of harmonious transportation, we adopt reasonable external structure and high efficient internal drive, constantly improve product craftsmanship, raise strict demands on details, and strive to provide the most perfect user experience. We adopt careful ladder design and perfect fashion elements, providing customers with high-end public traffic escalators that have good appearance, top quality and superior performance. Excellent drive system and high-power main engine ensure the higher transmission efficiency, stronger driving force and lower power consumption. New microwave frequency conversion technology protects it from the interference of environment and other factors, making escalator more sensitive, reliable and energy-saving at the same time, and ensuring safety of operation. The whole structure passes the strict computer finite element analysis, the truss adopts robotic robot welding technology, thus greatly enhancing the manufacturing process and making it more sturdy, wearable and beautiful. The special built-in roller step chain can effectively reduce the noise during driving operation, increase lifting height, increase the strength and service life of aluminium-core wheels under high lifting distance. PLC automatic lubrication system provides ideal lubrication for gearing chain during operation, extends the service life of transmission device. New soundproof rubber is posted on the internal baseboards, thus effectively blocking noise generated by machine transmission and components friction.